The most obvious improvement to cars, would be to mold the plastic on the front of the vehicle to be smooth and round, with grill openings that are sized (and placed) only as required to cool the engine. Some new plastic bumper covers and grill pieces could be snapped onto cars. Flush covers should be used on all lights. Fairing pieces could be added to side mirrors. Hood gap gaskets, and streamlined wheel covers are easy, too. Sealing all the seams and joints (with gaskets/backing flanges) in the high pressure areas of the vehicle, & flush side glass. Smooth floor pans with no sharp protrusions — this is part of the drag just as much as the parts of the car that can be easily seen. Smoothing the underside with covers (like the GM EV-1, the 3rd gen Prius, the 1939 Maybach, as well as the VW 1 Liter car, the 1937 SchlÃ¶r â€œPillbugâ€ and the Aptera). Transmission ratios should be optimized for efficiency at normal driving speeds. Higher gearing with 6-7 speeds would be optimal (smaller engines need more gears to work efficiently); or CVT transmissions. Narrower and lighter, LRR (low rolling resistance) tires should be used. Use very high quality wheel bearings (ceramic or precision steel) and make alignment robust and easy to service. 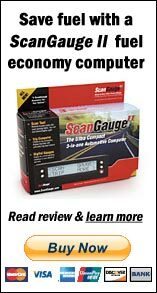 Average & “instant” MPG displays, that are on all the time; so the driver can compare them. The new Honda Insight, the 3rd gen Prius, and some Ford models, have excellent displays that help the driver be more efficient; with different color backgrounds indicating how efficiently you are driving. Throttle control (rather than cruise/speed control!) that maintains even throttle in a user-set speed range, with minimal throttle increases to maintain the speed in that range. This should also decrease throttle and coast when the speed is higher than the user set range. Tire pressure monitor, that warns the driver when the tires get below the recommended pressure (which could be adjusted upwards if the driver wants to run a pressure up to the tire sidewall maximum).Â Or better yet: fill tires with foam, so they would never deflate, and minimize rolling resistance. Efficient & effective fresh air flow through the vehicle, with intakes on a high pressure area, and exhaust vent(s) out the back of the vehicle into the low pressure wake zone, providing passive ventilation; and also reducing aerodynamic drag. Coat all the window glass to exclude as much heat as possible. With effective fresh air flow (see above) this may completely avoid the need for A/C (see below). On defrost mode, the A/C should only come on automatically at maximum defrost (if at all), and it should be on a timer of ~1 minute, and it should always be toggled on/off by the driver. I would prefer to make A/C on the defrost setting optional. Efficient lights such as LED’s and HID, that use a little power as possible while functioning as well (or better) than incandescent lights. Lower consumption electronics, such as A/C, fans and audio systems. Some/all of these could be powered by solar PV panels with a robust battery system; even in conventional internal combustion engine (aka ICE) powered cars. Active grill, that opens when more cooling air is needed, but remains closed â€“ and is more aerodynamic most of the time. This can also be done passively with the right airfoil shapes that effectively closes off air flow when the velocity goes up. Wheel alignment and brake drag needs to be minimized, easy to adjust, and robust â€“ to maximize rolling efficiency. Fully ducted engine cooling system, with the intake down low on the front, and the exhaust flows into a low pressure zone; minimizing the size of the radiator and the reducing the “internal” drag as much as possible. The Britten V1100 (racing) motorcycle is an good example of how this could work.Â NASCAR has shown that for a fully ducted cooling system, you only need 16 sq in for every 100HP. Automatic engine shut off and start up; at least with CVT (or automatic) transmissions — and possibly with standard shifts, based on having both the clutch and the brake applied? The Toyota/Scion iQ will have this feature. Lean burn in low vacuum conditions. Use variable valve timing to gain efficiencies. Store hot coolant in a vacuum insulated tank, to speed up warm-up time; a-la what the 2nd generation Prius does. Or, do what the 3rd generation Prius does: heat the coolant quickly using the exhaust heat. Preheating intake air would also help fully vaporize the fuel; making it higher efficiency. Tighten up wheel openings, and always use aerodynamically designed wheels/covers, with rear wheel skirts (at least optionally). Make roof racks removable. Years ago, I saw a “papoose” add-on storage system that locked onto the back of the car, with a single caster wheel to support the weight — it tucked completely into the air flow behind the car, forming a boattail; and it would be a great way to add storage space when needed; that did not affect how you drove very much. It could actually greatly improve the overall aerodynamic drag of the vehicle. Regenerative shock absorbers: MIT has a method of using hydraulics to drive a generator, eliminating the need for a mechanically driven alternator; or, to charge the electric drive (aka traction) batteries. These can also be used to lift and level the vehicle, to improve aerodynamics under different loads. Use a composite wheel/tire that has low weight, very low rolling resistance (by being strong enough to stay round), and low aerodynamic drag, no worries about inflation — and tune the suspension to work with said wheel/tire. (see item above) This could gain even more energy, since very little would be damped by the tires. For new 4-cylinder internal combustion engine designs, the crankshaft could be split with a hydraulic coupling that can automatically disengage two cylinders completely; saving all the pumping and friction losses, for situations when 2 cylinders are enough to provide the required torque to move the vehicle. There are also cam-driven designs that about double the efficiency of the ICE. Multiple car door latches could be used to increase strength & safety of the chassis — helps to further reduce weight, increase strength & rigidity, without requiring an unusual entry method (such as the VW 1 Liter car or the Loremo). Make every vehicle with a plug-in electric w/ serial hybrid ICE drive train, with regenerative braking. Use a cam driven engine that spins the armature and the stator in both (counter-rotating) directions, to charge the traction batteries. The engine could have rotary valves to reduce parasitic losses. It would run at it’s ideal RPM to drive the torque load of the alternator. Rework the overall shape of the vehicle to reduce drag. Cd of 0.13 – 0.25 are achievable! The 1937 SchlÃ¶râ€œPillbug” seats 5-7 people and has a Cd of 0.13 â€“ this car should used a model! This is an *amazing* list of mods every car manufacturer should do. Have you done any cost/benefit analysis? Or is this a case where it will cost more, but benefit society as a whole? Thanks Randy, I’m glad you found it useful. Some of these are very low cost, if not a zero increase over what is already spent. Others will cost some in R&D, but again not too much different from what is already spent. I think a lot of the changes and expense that car makers are currently doing (to provide annual changes so they can sell a “new” model each year) could be refocused on making only qualitative changes — evolutionary changes, and all or most of these improvements that I’ve listed would have pretty good return on investment. In the end, doing “the right thing” usually also is the least expensive. If only because the number of junked cars would be greatly reduced, and we would not have to fight wars over resources like oil. I think one way car manufacturers could save money and weight is to replace many fittings with Velcro. As many people know, it is nearly impossible to pull apart when pulled sideways. Hence, vibrations won’t cause it to come loose over time, unlike metal fasteners. It also makes removal and replacement of parts quick and easy. Obviously not every part can have Velcro on it but certain parts, such as bumpers and fenders, could use it. Serial hybrids [should] use some of the energy near the end of the battery charge to run a block heater to warm up the ICE. Use the ICE coolant system to cool the electric motor, the electric controller, and/or the battery pack — it would preheat the engine for start up & help to heat the cab reducing the need for electric heating. This is pretty interesting! do you or any of the staff ever do radio interviews? We are interested in booking one about this. check out our webpage and let me know what you think. it would be for the morning show. Wow! What a great list. Thanks Neil. Let’s get the car makers, their engineers and more people to see these suggestions. I love the idea of a throttle control. I hate my Prius cruise control. I also would like to see all high mpg models gauged to the hilt, any sensor or measure they should make available as a graph or a number. The manufactures should sell an eco model version of their cars. They may add a little extra cost, as they due in things like touring models, but they can show a decent mpg increase and give the consumers something to talk about, I bet they would sell. *Use GPS and elevation data to “learn” more efficient throttle control, that could be used on the highway (for cruise control) and/or it could be integrated into a “throttle-by-wire” control. *Use an EV drive train, combining batteries and a supercapacitor, and a “smart” controller, that makes use of GPS and elevation data, to use the supercap for the high current regenerative charging and short(er) duration acceleration, and/or to then charge the battery at a rate that does not stress them. In other words, using the supercap as an I/O energy cache, to reduce the requirements on the battery. This can either reduce the cost of the battery, and/or increase the battery lifespan and probably increase range; especially in high traffic urban driving or in hilly conditions. Driving on flat terrain at (more or less) constant speed probably will be more dependent on the battery, and less on the supercapacitor. Any more ideas you have, and/or discussion of what is already on my list — is welcome! I’ve got another item that has indirect benefits: instead of thick foam and spring seats, they should be mesh or fabric stretched onto frames that provide the right ergonomic shape and provide good support without weighing so much, and taking up a lot of space. This allows a smaller and lighter vehicle because the size of car can be smaller and/or just have more room. I kinda doubt that a fuel additive will help much, if at all.